Star Wars Rebels and its leader, Dave Filoni, always bring something big to Celebration. In 2015, it was the excitement over the return of Ahsoka Tano as Fulcrum for Season Two; in 2016, the reveal of the legendary Grand Admiral Thrawn as the big bad for Season Three. This year, the announcement was bittersweet, but equally significant: Season Four will be Rebels’ last. Always focused on the story, Filoni emphasized the importance of concluding the character and plot arcs from Rebels in the right way. Unlike his experience with The Clone Wars, which ended before several major elements of the series’ denouement could be completed, Rebels has the opportunity to deliver climax and catharsis on its own terms. By its conclusion, Rebels will have produced 73 episodes, a very good run for an animated television series. Filoni noted that each generation of Star Wars fans has its own special piece of the franchise, and the children who were introduced to Star Wars through Rebels will get to see their favorite characters reach a natural endpoint for their tales. He also reassure fans that the finale of Rebels is not the end of projects from Lucasfilm Animation, and more great storytelling is yet to come. First, though, Filoni asked fans to celebrate the incredible stories ahead in Season Four, using words like “special” and “different” in promising the best work Lucasfilm Animation has ever done. 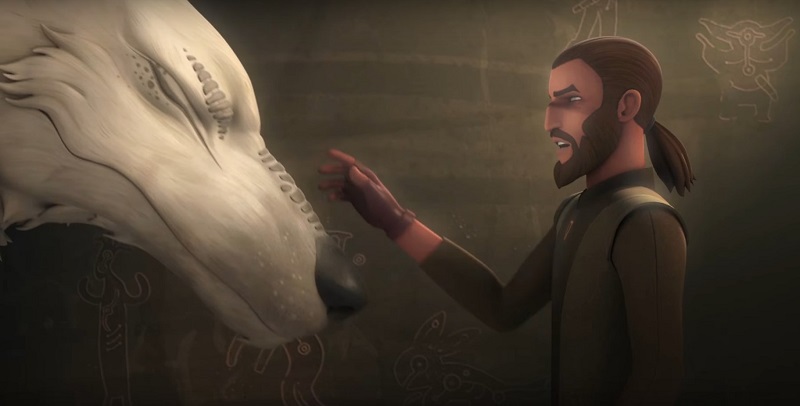 Before turning to what to expect for Season Four, the panel – Filoni and the voice actors of the non-droid members of the Ghost crew – shared their highlights from the recently concluded Season Three. Taylor Gray remarked on the lessons for Ezra in “Twin Suns,” and Tiya Sircar praised the character growth for Sabine in “Trials of the Darksaber.” Freddie Prinze, Jr., shared his nickname for the Bendu – “Force Moose” – and commented that Kanan had learned how to be a better Jedi from a different teacher in each season of Rebels: first the Inquisitor, then Maul, and lastly Bendu. But Steve Blum brought the house down with his reference to #HotKallus for the enemy-turned-Fulcrum with a personal connection to Zeb. Without getting into spoilers, the panel then looked ahead to Season Four and the challenges facing the Rebels protagonists. Vanessa Marshall explained that the losses suffered by the Rebellion at the end of Season Three have made Hera more committed to the cause, sharper and more focused in her determination not to miss the window of opportunity to strike against the Empire. Blum commented that Zeb has grown into more of an uncle than a brother to Ezra and Sabine, taking on greater responsibility and making better choices to serve the Rebellion. Filoni joked that Chopper had become a tough negotiator over his contract after appearing in Rogue One, then drew serious in pointing out that while the droid may not have a character development arc, truths can still be revealed about him – and sometimes the most cantankerous people are the ones who actually care the most. Sircar did not want to say too much about Sabine’s storyline, but expressed her admiration and appreciation for the Mandalorian episodes focused on her character. Prinze drew together Kanan’s growth over the series, noting that he has learned not only more about being a Jedi, but about being a parent, as well. Over the span of Rebels, Kanan has transitioned from a cool uncle to a wise Jedi who, by the time of Season Four, sees more than ever before with a certainty that can only come from attunement to the Force. Gray concluded the discussion by referencing a conversation between Ezra and Kanan in the season finale, where Ezra says that Kanan has taught him how to be a good person as well the Jedi teachings, and explained that this theme continues into Season Four. While Season Four concludes the story of the Ghost crew in Star Wars Rebels, they won’t be the only characters featured in the episodes. Mon Mothma returns as leader of the Rebellion, and the entire look of the show moves closer to the aesthetic of Rogue One and A New Hope, including the iconic Yavin base. Saw Gerrera returns, as well, with Filoni sharing an image of the outcast rebel and his ally Two-Tubes in a U-wing cockpit. Thrawn remains the principal adversary, but the esteemed admiral adds a new challenge to the mix – the Noghri assassin Rukh famous from the Timothy Zahn novels. Having successfully guilted Filoni onstage at Celebration London, Warwick Davis joins the Rebels voice cast to portray Rukh. The panel ended with the fans in attendance being treated to the premiere of the Season Four trailer. After ending the livestream feed, Filoni then announced an exclusive premiere of a Season Four episode, “Heroes of Mandalore: Part 1.” If this episode is any indication of the storytelling and animation quality for the season, fans are in for a real treat as we celebrate the final stories in Star Wars Rebels. After the panel, Filoni and his actors reassembled for a press conference with media. 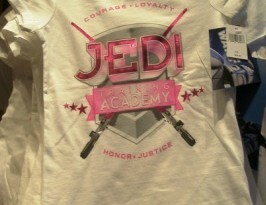 The first question asked Filoni about his shirt – during the panel it had read Ahsoka Lives? but after the Season Four trailer was shown prior to the episode, he had changed to one reading Ahsoka Lives! True to form, by the press conference Filoni had again changed back to the question mark version, and denied any difference as the product of an optical illusion. Sircar noted that the crew had known for a while that Season Four would be the last, but Filoni and the team valued being able to share the news in person with the fans at Celebration. Filoni added that the somber ending of Season Three is needed to set up a feeling of victory later, because Star Wars cannot deliver endings with happiness, exhilaration, or hope without first revealing the stakes of defeat. 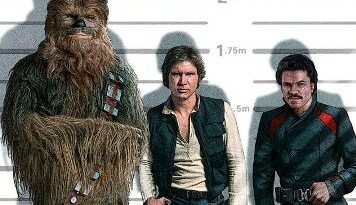 This makes another connection between Rebels and Rogue One – the Rebellion’s leaders are hesitant to strike aggressively at Scarif in part because of their massive defeat at Atollon. Marshall fielded the question about the relationship between Hera and Kanan, offering only that it is explored further in Season Four. 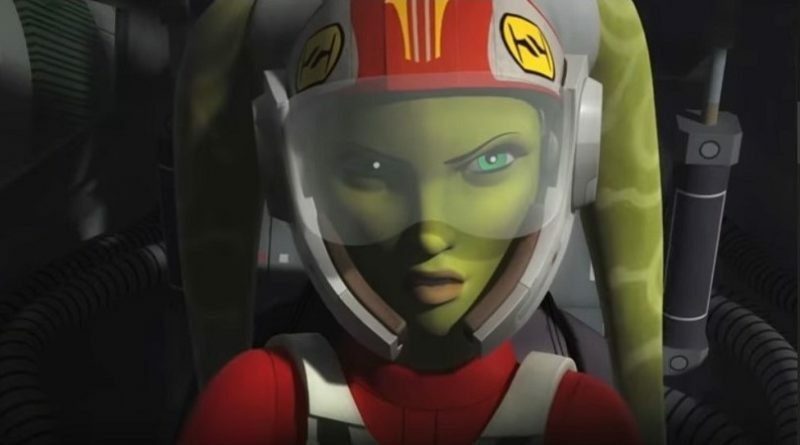 Filoni noted that he had originally planned to have Kanan narrate the Season Four trailer, but changed his mind to have Hera narrate it because it was her force of will that drew together the Ghost crew to fight for the cause of freedom. Progress Toward More Pink Lightsabers? 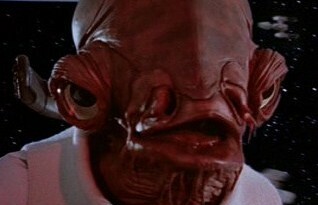 Date Night with Star Wars Characters: It’s a Trap!